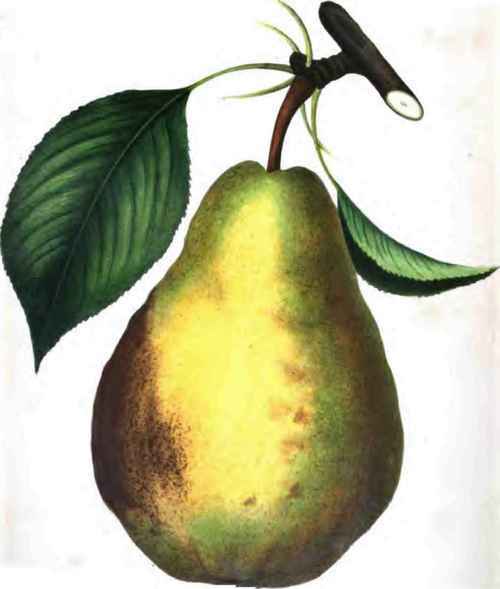 We trust the well-informed readers of the Horticulturist will not take it amiss that we offer them in our frontispiece a portrait of one of the best known and most popular pears in America - the Bartlett. We are well aware that we can scarcely say anything of this fruit that is not perfectly well known to all fruit-growers of experience, for scarcely any man in the country plants half a dozen pear trees without including one or two Bartlett; but there are thousands of beginners in fruit-culture who are at this moment informing themselves, as well as they can, respecting what varieties to plant, and who are, after all, as ignorant of a Bartlett as they are of the greatest novelty in all the catalogues - and perhaps more so, for now-a-days the papers say much more of novelties than of good old established sorts. For the particular benefit of such people we give the Bartlett a place at this time, and we commend it heartily to them as every way worthy to be placed at the head of their selections. No other variety we can name has stood the test of so many climates and localities as this. Literally from Maine to Georgia we hear of its successful culture, with here and there an exception. At all the pomological meetings that have been held, no other, we believe, has been so unanimously placed upon the lists for general cultivation. It is an especial favorite with the New England cultivators, and is so extensively grown there as to be abundant and cheap now in the Boston markets. It was originated in Berkshire, England, about the year 1770, and was introduced by a Mr. Williams, a nurseryman near London, and there called Williams' Bonchre-tien, which name it is still known by in England. In the French and Belgian catalogues it is called "Williams'," or "Poire Guillaume; latterly they add "Bartlett of the Americans? The name Bartlett, by which it is almost universally known in this country, was originally given to it in consequence of being imported and first grown here by Enoch Bartlett, of Dorchester, Mass., who lost the name under which it was sent to him. It was sent from England to Mr. Bartlett about the year 1799, so that it has been now upwards of half a century in this country; but it has not been widely known more than half of this time. In Kenrick's American Orchardist, edition of 1833, it is classed among new varieties. At the present day it is, we think, more extensively propagated in the nurseries than any other variety, save, perhaps, the White Doyenne, the staple of the pear trade in Western New York. Fruit - large; on young vigorous trees often very large, in some cases weighing a pound. Form - pyramidal, irregular. Surface - quite uneven. Skin - smooth, light yellow, with a delicate blush frequently on the sunny side. Stalk - stout and fleshy, an inch to an inch and a half long, and but slightly sunk. Calyx - open, shallow. Basin - very slightly plaited. Flesh - white, fine-grained and buttery, with a rich musky perfume, not wholly agreeable to many tastes; ripens all through Sept Few pears admit of being picked so soon as the Bartlett, for they ripen well when gathered even before they are fully grown; and this quality is of great value, as it allows them to be picked and transmitted to markets at a considerable distance. The tree - a handsome, erect grower, vigorous, and exceedingly productive, bearing quite young, both on pear and quince. It is readily distinguished by its narrow folded leaves and yellowish shoots. It takes and grows well on the quince, but is so disposed to fruit-fulness as to become very soon enfeebled, unless pruned pretty close annually, and the soil about its roots kept in a condition to afford abundant nourishment The reason why this pear is short-lived on the quince is, that the course of management is not adapted to its habits.